For some unknown reason many people are convinced that only Amazon could open a college bookstore with no books, but that simply isn't true. Amazon has several competitors currently disrupting the college bookstore industry, including eCampus and textbook distributor MBS Direct. Owned by B&N founder Len Riggio, MBS Direct offers a virtual bookstore platform which dispenses with a physical location entirely. It has signed private high schools as well as colleges and universities like Liberty University, including most recently Chadron State College in Nebraska. CSC announced this week that it was opening the virtual bookstore just in time for the fall term. Its previous bookstore operator had been sold, and after investigating the various options CSC concluded that online was clearly the best choice for students. “We are pleased to be working with MBS Direct and expect to provide students with affordable and reliable service into the future,” said Dale Grant, Chadron State College vice president for administration and finance. The space occupied by the bookstore in the CSC Student Center will be taken over by Outlaw Printers, a Chadron, NE -based printing service. It has a contract to operate a store which carries CSC-branded merchandise - but not books. The store will look a lot like a traditional college bookstore - just without the textbooks and class materials. When it comes to college bookstores Amazon is getting all the press, but what the media isn't telling you is that the college bookstore industry is facing serious disruption as college students buy more and more stuff online. College bookstores are closing left and right, including a bookstore in the college town where I grew up. Jayhawk Bookstore has been serving students at Kansas University for decades, but it closed this summer. Its owners noted that instructors have been changing how assign course material for their classes. "There's also more a drive towards using course packets, smaller chunks of information from different sources," said Jeff Levin, co-owner of Jayhawk Bookstore. Levin also reported losing business to online retailers like Amazon. "The landscape of retail in general has been changing, in particular college textbooks. It's not just traditional textbooks. There are obviously e-books and rental books," Levin said. That shift to online retailers has lead a lot of colleges and universities to replace the traditional college bookstore with either an online virtual store or with a book-less pickup location. As I'm sure you know Amazon has plans for fourteen unstores at US colleges and universities, including most recently at the University of Illinois Urbana-Champaign, but in this area they are dwarfed by eCampus. The latter has a Virtual Bookstore Program which currently serves as the official bookstore for over 150 schools nationwide. Many of the schools went the way of Wilson College, whose bookstore is completely virtual, but others chose to also have an Amazon-style pickup location. 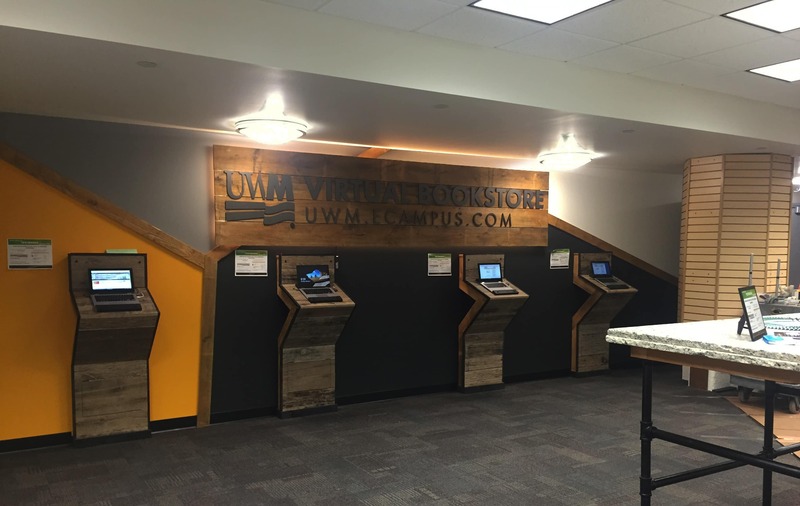 For example, the University of Wisconsin Milwaukee elected to have eCampus put in a virtual bookstore when the vendor won the contract bid last August. As you can see in the photos, it looks not dissimilar from the Amazon unstores which dot the college landscape. It has kiosks, a service counter, and UPS delivery boxes (in place of Amazon's delivery boxes). eCampus promises delivery within two business days (without any pricey membership fees). Students are notified of a textbook's arrival by email or text message, and they can come to the store to pick up their order before heading off to class. This, folks, is the future of college bookstores, one where almost everything is bought online and where the college bookstore is reduced to little more than a gift shop and a convenience store. If you are in love with the idea of bookstores, that might sound frightening. Me, I can recall just how much textbooks cost and how little value I got out of a college bookstore, so it bothers me not at all. Interesting. I keep thinking that people underestimate Amazon’s grip on the ebook market. Right now it is so powerful because it really offers a lot, for readers and authors. But that could change. There’s no reason it couldn’t be disrupted if it doesn’t continue to offer the best deals on both sides. I suspect Amazon knows it’s vulnerable which is why it keeps rolling out new features (like Kindle Unlimited). I’d be curious exactly what the advantage eCampus has from the point of view of the colleges that are choosing it. Are they offering a bigger cut to the authors of the text books? 90% rather than 70%? That seems like an area where Amazon might be vulnerable. If a professor puts a textbook up on their site, an extra 20% per student would be nice. Or does the college get a cut? As you mention they have two day shipping without a membership fee, but there’s got to be more to it. This really doesn’t have anything to do with authors. It’s more about how online retailers are disrupting college bookstores just like regular bookstores. How does the used textbook market work on a campus with a virtual book store? I wouldn’t like that. I see how well my kids retain information they “learn” online and lemme tell you, it’s not much. I’m a visual learner. I read in phonetics, but I remember in words and paragraohs and I need the visual reference to go back to. I wouldn’t be able to do this with ebooks or online. I’d end up printing half of it out, so there’s less net gain (cheap ink and time) than having the book. I guess I just assumed they were selling paper textbooks, maybe because of the pictures of kiosks and UPS lockers. The equivalent of Amazon paper books ordered online but with a self-service pickup area. They could also be doing the equivalent of the Kindle store for eBooks but I don’t think fixed layout eBooks, the kind you need for many/most textbooks, have really kept pace with the reflowable text eBooks. Except they are selling paper textbooks. It’s just that the textbooks aren’t stocked locally in the bookstore. They’re in a warehouse somewhere.